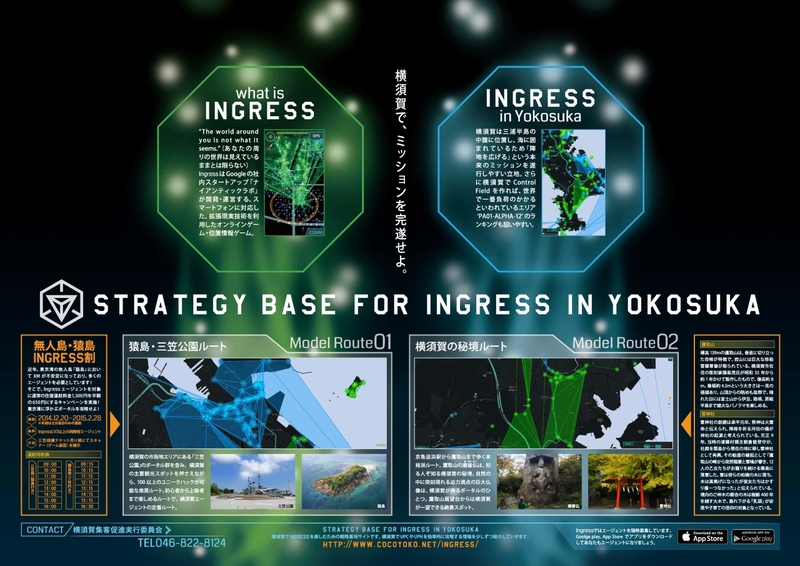 This is a web site for information related to playing Ingress - a location-based augmented reality game created by Niantec Labs – in the city of Yokosuka. We will keep you updated to information such as how to go around the city for Unique Portal Visits or original missions based in Yokosuka. Yokosuka city (Kanagawa prefecture, Japan) is located in the middle of the Miura peninsula. The city is surrounded by rugged coastline facing the Tokyo bay. Therefore, it is ideal for creating large control fields within the game. While Tokyo and its game region “PA01-ALPHA-12” is famous within the Ingress game world being one of the most densely populated area, if an agent can create a large control field in Yokosuka, it is possible to score highly in the ranking. There are reports that in the recent years, XM – exotic matter – is unstable in Sarushima, an inhabited island off the coast of Yokosuka. We wish to summon more agents to the region to take control of this volatile situation. For limited time only, Ingress agents can board the ferry to Sarushima under a discount fare. Date: From Dec.20, 2014, through February 28. 2015. Eligibility: Agents must be above Level2. Present your scanner at the Mikasa pier ticket counter for discount.